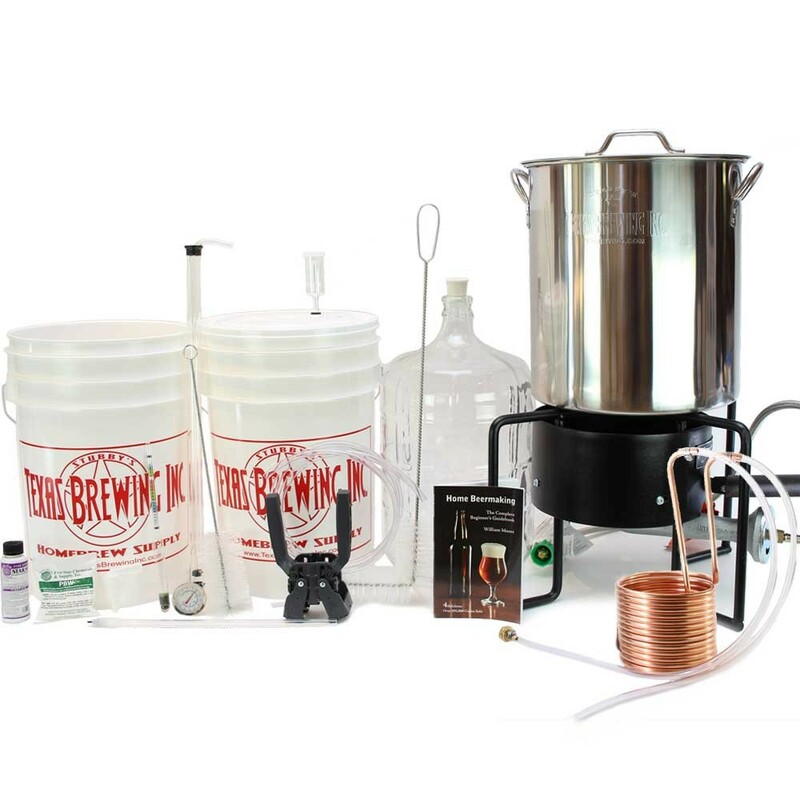 Super Deluxe Equipment Kit - 10 Gallon Kettle - No Ports - Texas Brewing Inc.
Why not start with everything you need, all at once? Our Super Deluxe Equipment kit is designed to get you going with the best gear as quickly as possible! Why not start with all the equipment you need for a full boil, temperature monitoring, and a fast cool down along with all the basic essentials? Well, our Super Deluxe Equipment Kit does just that! You get everything included in our Deluxe Equipment Kit, along with an outdoor Banjo Burner Plus that gives you even, fast heating for brew kettles up to 40 gallons that won’t scorch your precious wort as easily as center flame circular burners, a 9 gallon stainless boil kettle assembly with a ½ inch ball valve and 2 inch Bi-Metal thermometer that can be used to boil wort, mash all-grain recipes using the BIAB technique, or as a hot liquor tank, and a coiled copper immersion chiller with hose attachments to rapidly improve your chilling process. All in all, a robust tool set that gives you an instant brewery in a box! Plus, we made sure to include all the high-quality essentials you need, including an auto-siphon instead of a simple racking cane to make transfers faster, cleaner, and easier, a return-spring capper that won’t break your bottles, and separated industry standard cleaner and sanitizer products. The TBI Super Deluxe Equipment includes the following tools: Outdoor Banjo Burner Plus for up to 40 Gal Kettles, 10 Gal Stainless Steel Brew Pot with no ports, 25 ft x 3/8 in Copper Immersion Chiller with Hose Attachments, 6.5 Gal Primary Fermenter with Grommeted Lid, 6.5 Gal Bottling Bucket with Spigot, 5 Gal Glass Carboy for Secondary Fermentations and Clarification, "Home Beermaking" Book, PBW, Star-San, Triple Scale Hydrometer, Drilled Rubber Stopper for Your Carboy, Liquid Crystal Thermometer, Lab Thermometer, Siphon Hose and Shut-Off Clamp, Brew Paddle, Airlock, Twin-Lever Capper, Fermtech Auto Siphon, Bottle Filler, Bottle Brush, and Equipment Instructions.